reports to Ingram Micro Chief Financial Officer Gina Mastantuono. Anti-Corruption and Information Technology audit functions. University and an MBA from California State University, Northridge. the promise of technology. 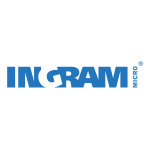 More at www.ingrammicro.com.